I already posted the November edition of Shift Change in Space at the beginning of the month, but yesterdays Soyuz launch to the International Space Station was so amazing that it warrants at least a little article of its own. The absolutely flawless launch from Baikonur and the later docking was so well-timed that there was an uninterrupted video stream throughout, showing especially the rendezvous with the station like it had rarely been seen before – with amazing views from both the station’s and the Soyuz’ cameras broadcast live from space. 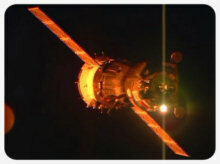 Fascinating highlights – like the Soyuz bathed in a golden glow from the setting sun – are already available of the launch, the docking and the wonderful welcoming ceremony on Youtube. The media’s reaction was, as usual, mainly lukewarm and not really interested – if it wasn’t for the fact that the Soyuz is also carrying a zero-g capable espresso machine called ISSpresso. The machine was developed by Lavazza and the italian company Argotec, which had already supplied food for the missions of Luca Parmitano and Alexander Gerst before, which is certainly interesting – but suddenly only the espresso and the kilo of caviar this launch also seems to be carrying are all over the press. [Edit: only the Guardian does it right by publishing an interesting in-depth article about the ISSPresso!] This already led to silly comments that there is too much luxury abroad the space station and that this is supposedly wasted taxpayer money – but who else can make space travel more comfortable with good food and drink if not the astronauts themselves? This is part of scientific research like everything else, which unfortunately gets mentioned not nearly often enough. There is also the somewhat belittled fact that Samantha Cristoforetti is the first female Italian astronaut going to the ISS, which should be really important and a completely normal at the same time. This time she also joins Yelena Serova, making the crew of the station 2/3rds female for the first time since Expedition 24 in 2010, when NASA astronauts Tracy Caldwell Dyson and Shannon Walker were part of the station’s crew. I shudder at the thought what the press would make of the fact that Cristoforetti and Serova are both on their first spaceflight, while Barry Wilmore, Terry Virts, Aleksandr Samokutyayev and Anton Shkaplerov are all on their second flight… but hopefully nobody is going there except to mention that the two women on the station are spaceflight pioneers in the best sense of the word. 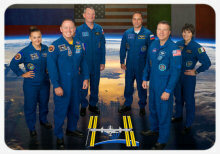 I think Expedition 42 is going to be amazing, whatever the press is going to make of it. Social media is playing a huge role in popularizing and supporting space space travel, and with the three new arrivals on the station it’s only going to be more interesting and fascinating. Comets have been visited by scientific spacecraft for a long time, but what is going to happen tomorrow will be something that has never been attempted before: to actually make a soft landing on a comet’s nucleus. ESA‘s Rosetta Spacecraft has already been orbiting Comet 67P/Churyumov-Gerasimenko (better known as Churry-Gerry) since August after a ten-year-journey and on Wednesday, November 12th, its Philae Lander will hopefully set down on the comet shortly after 5pm CET. I’m not going to write much more about the mission here because there are better articles about it everywhere else, but instead I want to give just a few tips how to follow tomorrow’s events. • Both NASA and ESA will provide live video from the event, with the ESA Livestream having already started today on 20:00 CET for 24 hours and NASA TV providing occasional coverage. 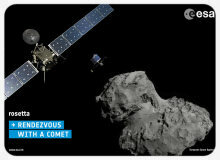 The ESA stream has also been embedded on the Rosetta Homepage now. • Emily Lakdawalla from the Planetary Society is in Darmstadt at the ESA control center to cover the landing. She has already posted her immensly detailed Landing Timeline which really has all the information about what will be going on. She has also filed a first report this morning with fresh information about Phlilae’s status and much more. To follow her, the best spot are her Blog at the Planetary Society and her Twitter Feed. • Emily has also put together a Twitter List with officially designated Rosetta/Philae Tweeters for all the up-to-date information which is very worth following and subscribing to. • Nicole Gugliucci and Georgia Bracey from CosmoQuest are going to dedicate tomorrow’s episode of the Learning Space Hangout to the hopefully successful comet landing. The hangout starts at 8pm CET, about three hours after the landing. The Weekly Space Hangout on Friday is also probably going to have a lot to talk about Rosetta. This is basically everything really important – I’ll update this post sometime tomorrow according to what happens, but everything else is now up to the two spacecraft themselves and the engineers behind them. Good luck Rosetta and Philae! It’s not so long ago that I wrote a previous version of this post, but this time I’m determined to write regular followups like this one. Tomorrow, the first half of Expedition 41 to the International Space Station, is coming home after almost six months in space and the station’s crew will be temporarily reduced to three astronauts before the next crew is launching soon and Expedition 42 is going to start. I just like to keep an overview on the crew changes on the space station and this time it’s going to be very interesting! On Tuesday, the failure of Orbital Science’s Antares rocket with the Cygnus space cargo freighter was a harsh blow to space exploration, but on Friday even worse news came with the breakup and crash of Virgin Galactic’s SpaceShipTwo during a test flight, resulting in the death of one pilot and serious injuries to another. Both accidents combined are maybe the worst event in spaceflight history since the loss of Space Shuttle Columbia eleven years ago, but unfortunately many people are already jumping to all the wrong conclusions.